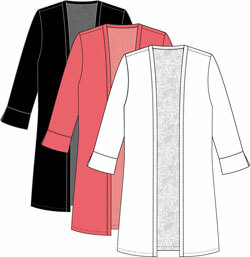 Cardigan w/Lace Back - Can be worn as a twin set by coordinating with lace shoulder tee - sold separately. Whether you're on the go or hanging out at home, this cardigan will add a layer of versatile style to any outfit. It can be worn on its own or paired with matching short sleeve tee style # 3230O. With three-quarter sleeves and a dainty lace design running down the back, this piece is the definition of fun and fashionable. The only reason I gave 4 stars is due to the fact that this item runs a little small. I purchased an XS based on the size chart. Had to reorder a small. Otherwise the sweater is very nice, the lace insert on the back gives a nice touch. The sweater is very thin so it will not provide much warmth but will be great for air conditioned buildings during warmer weather. If you are between sizes you should probably size up.